Rarely do I have anything negative to say about Sun City Texas. This is my home, I live here, I play here and I work here. Alas, even Sun City Texas isn’t perfect. One ongoing problem we have is that many people disregard the speed limit in Sun City, which is generally 35MPH. It is not uncommon to see folks tooling along well over 50 as if they hadn’t a care in the world. Many drivers forget this is a golf cart friendly community and we share the road with hundreds of golf carts at a time. This mix of unusual traffic makes it imperative that automobiles be mindful of the speed limit and slow down. 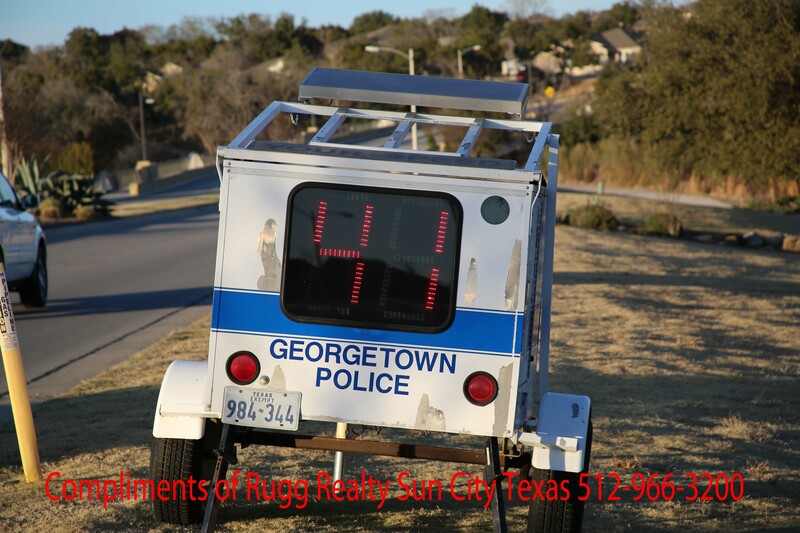 The Georgetown police have agreed to step up patrols in Sun City at the residents’ request. The first step is to put the automated radar devices on several major roads so drivers are aware of their speed. Soon to follow will be writing citations to those caught in a violation. Please consider this your public service announcement from Rugg Realty. The ticket you avoid may be your own, and please, drive carefully.